Is Trowse Newton really in Norwich? It feels as if it is, sitting as it does just off of the outer ring road, and overshadowed by the tower block of County Hall and the vast Colmans Mustard works. But when I suggested to the old boy who came to open up that this was the last medieval church in Norwich left for me to visit, he gave me a wry look. He'd lived here for years and years, and he didn't think Trowse was in Norwich. "Norwich? Where's that?" he said. St Andrew has three keyholders and a welcoming notice, unlike its unfriendly neighbour around the ring road at Lakenham St John. That said, it had an unwelcome visitor one night in the 1980s when a joyrider spun out of control at the exit from the lane to Whittingham, and crashed into the east end of the church. He almost destroyed what is undoubtedly the most interesting feature of the church, the east window tracery and an inscription beneath it which reads in Latin William of Kirkby, Prior of Norwich, placed me here. Kirkby was Prior from 1272 to 1289, and so the window in question is right at the start of the Decorated style. Pevsner compares it with the great east window at Lincoln Cathedral, which can be confidently dated to 1275. 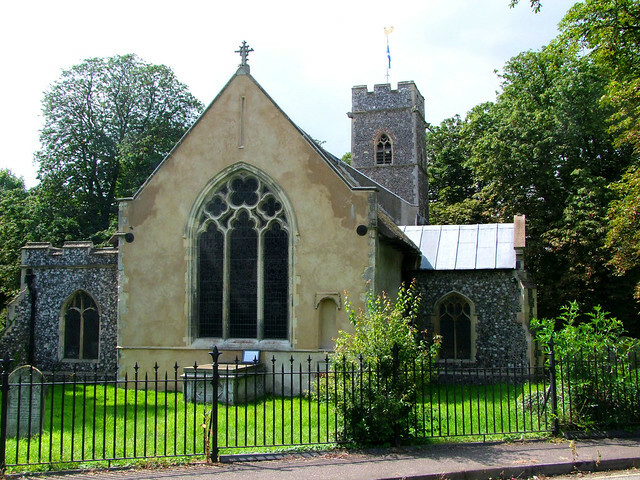 The city of Norwich may be ignored here perhaps, but the Colmans may not, for although they were non-conformists, this church was in the family's patronage. Their influence here is felt two-fold. Firstly, they paid for a late, major restoration in 1901, after the church had been severely damaged by flooding. The nave was substantially rebuilt at this time. Secondly, the interior benefits from some of their somewhat idiosyncratic art collection. The major feature is the vast altarpiece originally in St Michael Coslany. This is enormous, perhaps ten feet high, and is now set on the south wall of the nave. It dates from the first decades of the 18th Century, and was the work of the Norwich artist Charles Heins. It may well have once sat at the east end here, for the four figures which originally flanked it are still in situ either side of the east window, now sadly filled by fairly execrable Edwardian glass. However, the most memorable feature is the set of three 18th Century life size figures, two angels and a king, who sit playing instruments in front of the pulpit. They must have come from a Dutch or Flemish organ case, and were probably collected by the Colman family in the early 19th Century. Appearing to match it, but probably local work, is the dramatic 18th Century pelican in her piety forming the lectern across the nave. It was probably only formed into a lectern at the time of the 1901 restoration, which was also contemporary with the reredos, again the work of a local carver, which presents the Last Supper in neo-realistic three dimensional detail. Amongst these exotic attractions, something from the much more distant past sits waiting patiently. This is one of the city's best 15th Century fonts, sadly defaced but replete with detail. Lions alternate with angels holding shields, while around the base clerical figures sit among the evangelistic symbols. Finally, don't miss the parish's World War Two memorial, the surprisingly few names suggesting that this place is, in fact, no part of Norwich. They are engraved on a light-hearted medallion in the 17th Century style, so convincing that unless you took a moment to read it you might think it really was that old.